↑ In 617, the rebel general Li Yuan (the later Emperor Gaozu of Tang) declared Emperor Yang's grandson Yang You emperor (as Emperor Gong) and "honored" Emperor Yang as Taishang Huang (retired emperor) at the western capital Daxing (Chang'an), but only the commanderies under Li's control recognized this change; for the other commanderies under Sui control, Emperor Yang was still regarded as emperor, not as retired emperor. ↑ After news of Emperor Yang's death in 618 reached Daxing and the eastern capital Luoyang, Li Yuan deposed Emperor Gong and took the throne himself, establishing the Tang dynasty, but the Sui officials at Luoyang declared Emperor Gong's brother Yang Tong (later also known as Emperor Gong during the brief reign of Wang Shichong over the region as the emperor of a brief Zheng (鄭) state) emperor. 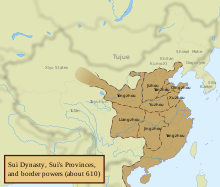 ↑ Meanwhile, Yuwen Huaji, the general under whose leadership the plot to kill Emperor Yang was carried out, declared Emperor Wen's grandson Yang Hao emperor but killed Yang Hao later in 618 and declared himself emperor of a brief Xu (許) state. 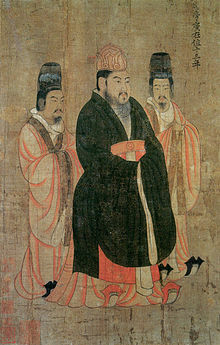 As Yang Hao was completely under Yuwen's control and only "reigned" briefly, he is not usually regarded as a legitimate emperor of Sui, while Yang Tong's legitimacy is more recognized by historians but still disputed. ↑ ক খ Benn, 2. Bingham, Woodbridge. 1941. 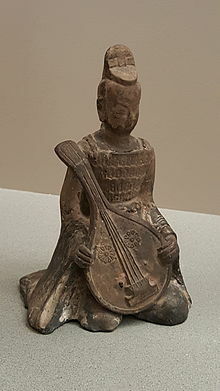 The Founding of the T'ang The Sui dynasty: The Unification of China. A.D. 581-617. Alfred A. Knopf, New York. আইএসবিএন ০-৩৯৪-৪৯১৮৭-৪ ; 0-394-32332-7.